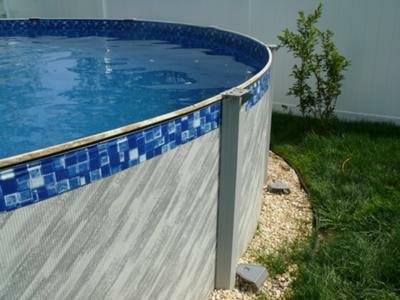 Anyone know where I can get a resin seat clamp for the Oyster Bay 7000 30x52 round pool. The part is numbered 31063-6. It's supposed to have a 25yr warranty; the pool is less than 5 years old and one seat clamp is broken and another is cracked. Family Leisure in Nashville (formerly Watson's) says it's not under warranty the warranty says sides/tops have 25 yr warranty. Family Leisure in Nashville was awful. We went there last week to get some of these. Part 31063-6. It took the guy about 30 minutes to find 4. I needed 12, so now I am still 8 short. And of course the guy had no idea how to get more. It was ridiculous how clueless those people were/are. Still havne't found the other 8 yet, but i'll let you know if I do. Did you ever find any & where? I am looking for those now. Looks like a pool favorite ... Has anyone found this part? We purchased this pool in 1986. We are moving it to our new location in 2012. During this process we have discovered several of the bottom rails used to secure the outside wall are rotted. Where can we purchase replacement bottom rail tracking for this pool? I have a Patriot Silverado 15x30 pool that I purchased about 5 years ago. It was a floor model. 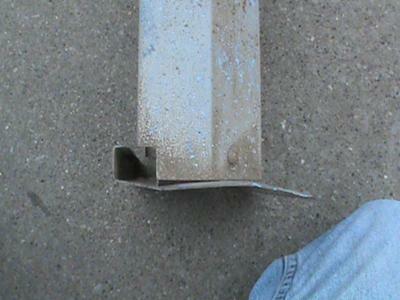 The top connectors (inner and outer) that cover spaces between top rails are cracked and some fell apart completely and top rails are exposed with sharp edges. The place where I purchased the pool does not have any in stock and cannot get them as Patriot Pools is no longer in business..They gave me some other connectors but they don't fit. So I have a pool that I don't want to take down, but without the connectors, I'm afraid that someone may be in danger of getting cut. Is there anywhere or anyone that has this type of connectors? I have an Aqua Leader, Reflexions, Above ground pool I'm tryiing to put back up and I am missing 3 of the back caps-part#103_ _160000...I have checked the Aqua Leader website trying to find where I can order replacement parts to no avail. any clues?? I have a Patriot Silverado above ground 15x30 oval pool,over 5 years old. The top connectors are in 2 parts (inner and outer connector). The connectors are made of resin. Over the past few years the connectors are cracking, I guess from sun and chlorine. I went to several pool places and made some phone calls, but have not had any luck in getting them. It seems that Patriot pools are no longer in business. I just need to cover the space between the rails. Maybe the connectors are universal and connectors from another pool manufacturer would be compatible. If anyone can help me, I would appreciate it. I recently inherited an older pool. All is in pretty good shape except for the bottom rail sections. I was able to salvage 2 of them. It appears that I need 10. It is a 15 x 30 with 48 inch rolled wall. I am having a hard time identifying the make/model as well as locating replacement bottom rail sections. 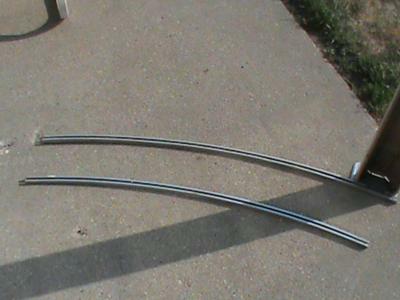 the bottom rails are 15/16 wide, 11/16 high and measure 49 1/4 inch long measured on the outside of the curve. They fit in the footplates as the male. Any help would be greatly appreciated. Someone thought it was a Muskin, but the physical measurements of the parts weren't the same. I have enclosed a few pic for help. Thanks to anyone who can help me. Looks like the Sea Isle by USA Industries. I own an Intex 24 x 32 metal frame pool. This is our third year. Unfortunately, the bracket that holds the skimmer off the side of the pool broke. We tried super glue, gorilla tape, but it still is not right. I looked on Intex site, but the only one they seem to have are the skimmers that attach to a permanent wall for above ground pools. Is there anywhere I could just purchase the bracket or do I have to purchase the complete skimmer? Please help! Weather is in triple digits --very hot!! Thanks! 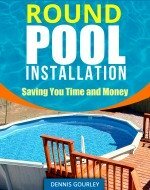 I have purchased a used USA Industries Sea Isle aluminum pool that is 24' round and 48" deep. 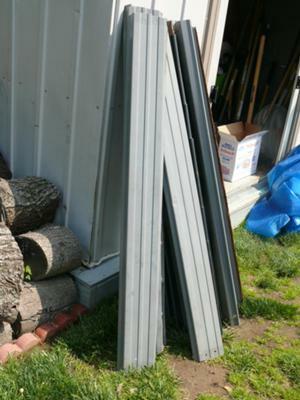 I have been searching for replacement bottom railing and bottom plates and been unsuccessful. Curious, if anyone has any info or where to find these parts. or know of anyone that may???? I will be looking forward to your response, I'm very desperate. Definitely do not buy replacement parts or liners from the web ad poolsupplies.com or ramcoindustries....very rude, outrageous price with warranty he quoted me over 600 for liner and when I asked what the price was he said 1700. Again very rude and acts like you are stupid for asking questions. I live in Key West and things rust incredibly fast here. I brought my Bermuda King (a.k.a. Sea Isle) round 24' X 48" above ground pool from the mid-west with me. I am re-building it and noticed the track is very rusted. I really don't want to buy another metal one. Has anyone tried a resin or made their own track? 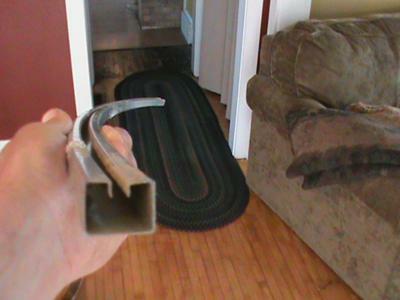 I saw a post about using the PVC track from lattice fencing. Is that strong enough? How do you rig it to the support beams? If not I will order new ones and try to paint them with rust resistant paint. I agree with a lot of people, the Bermuda King/Sea Isle is a nice looking pool, BUT it is overpriced and from what I am finding out there is only 1 place to buy the parts for it. Their parts are very overpriced and they are very rude. the pro-rate is a joke. I had a pump go out after the 1st year and the replacement pump was the same price that I found everywhere else. My pool was purchased by my parents when I was still in grade school (they can't find the paper work at this point to find the exact date, but think it was around mid 90's). I have recently moved the beast to my own backyard after the wall split at the intake/skimmer, destroyed the liner, and intake housing, and drained the pool. During the teardown we found the bottom ring was not salvageable, it had rusted all the way around. 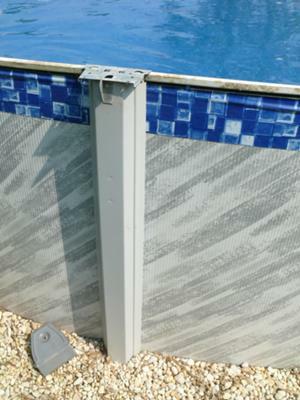 The current liner was not one for the pool, due to the sticks disintegrating years ago- and the replacements were like mini sized, that you were only to place in the corners- currently some sort of metal/plastic combo was slid over the top of the wall to pinch the current liner in place. They had made many replacements to liners (only recently not from the manufacturer due to being out of business) over the years due to living on black clay, and with Texas heat, the ground would crack compromising the bottom of the pool bed and cause it to tear/leak. 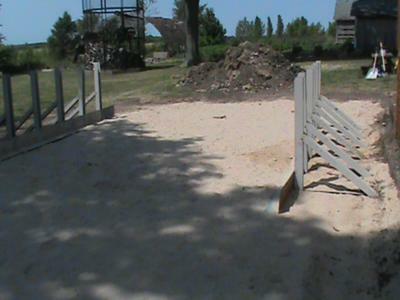 My parents would fill the bed with sand each change. They replaced the wall once, and I think the motor for the pump too. We have moved the pool to sandy loom, and want to make sure we are not going to compromise the structural integrity of the pool, and would like to go back to original parts. We need almost everything except for the deck and pump, but will need a new intake basket too. Where can I go to find these items- online or some store near San Antonio (the closet city to us)? A little bit more background info, my parents had what you could consider a semi-in/above ground pool- a portion of the pool was dug deep into the ground. What types of issues will I have being in sand if I did this? The walk around pieces have rusted through on the inside and the rust is falling in the pool. The pool was purchased as a Doughboy but when I sent pictures to Doughboy, they say it isn't their pool. If anyone knows what brand this pool is and where we can get parts to replace the walk around (deck) please let me know. Hi Julie. It is a Home and Rome pool and the deck did not come with the pool, it is homemade. Any carpenter could fix it for you. I wasn't referring to the "wooden deck" I was referring to the walk around on top of the pool. Sorry Julie. You are looking for Home and Rome top rails. I have this pool but no paper work. I need to replace the top "railing" that you see is taken off and seen on 3rd picture. I'm not sure how it is called. It is rusted and pieces get into the pool. I have no idea what brand it is. It is 18 round. Any ideas and if so where I can get parts? Thank you so much for you help. Hi Margo It is an Asahi Pool, parts can be found at asahipoolparts.com.